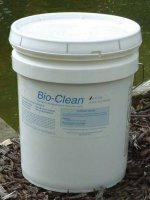 Easy Pro Pond-Vive Bacteria Bio-Clean is a proprietary blend of specialized bacteria, formulated specifically for the task of lake and pond maintenance. Microbe-Lift Bacteria Microbe-Lift bacteria is specially formulated to work in water garden ponds. It is a 100% natural, safe and beneficial bacteria and will not harm fish or plants. Microbe Lift Bio-Blue Specially formulated for lakes, lagoons, ponds, fountains and water features. Safely colors water blue while the enzymes help create a healthy pond environment by digesting organic waste and reducing noxious odors. Safe for humans, birds, fish, plants, and aquatic life. Use 2 oz. per 1000 gal of pond water. Microbe-Lift Algaway Control String Algae! No More Green Water. No More Algae Growth. Stops algae growth in ponds. Can be applied to areas that contain fish and plants (snails and crustaceans should be removed during treatment). Treats over 5000 gallons per 16 oz.